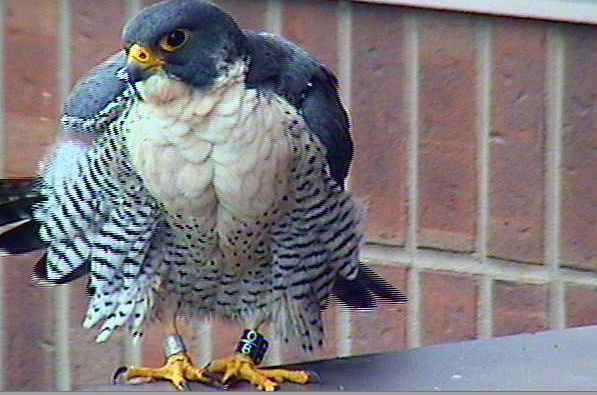 The peregrine falcons have once again nested at the Sheraton Hotel in downtown Hamilton. This year there are four eggs! This little one hatched on April 28th; still waiting for the other three siblings. 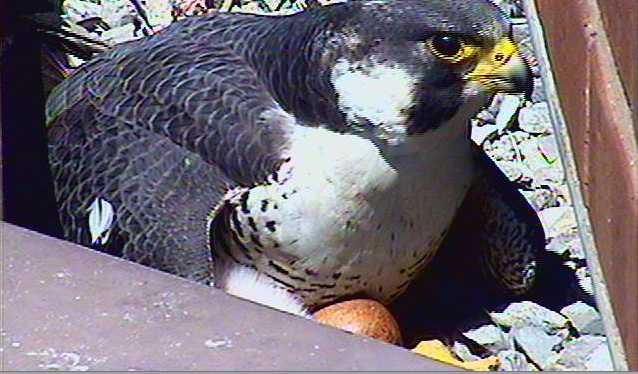 Unfortunately for us, Lily has for the second year, chosen the wrong end of the ledge to set up her nest. 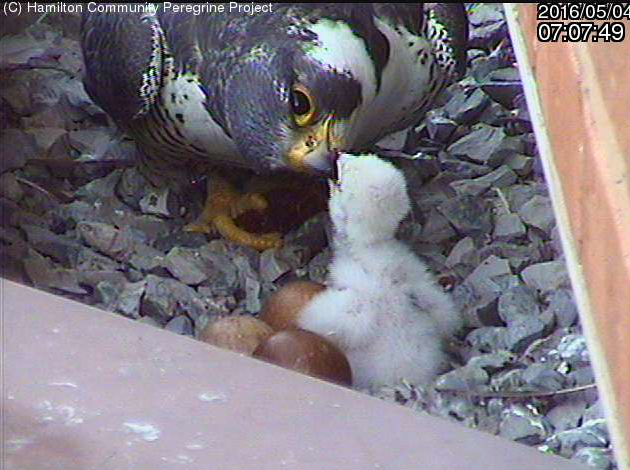 The other side would give the camera a perfect view of the eggs and hatchings. 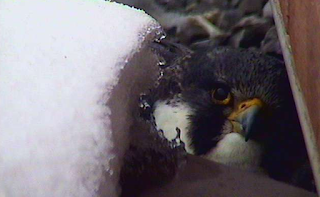 And, unfortunately for Lily, there was snow in early April, but she endured and stoically keep her eggs warm. There have been peregrines nesting on the 18th floor of the hotel since 1994 and I became addicted to the falcon cam around 1999. Finally, with more flexible time on my hands, I thought I'd volunteer for FalconWatch where groups of people keep watch over the fledgling chicks to keep track of their movements and feedings, and most importantly are on hand in case something goes wrong and a chick needs help. They are navigating a busy downtown core of a large city after all. I thought a two hour shift once a week or so. After the first outing, I was hooked and ended up going several times a week and was almost sad when it ended once the chicks were flying and feeding well on their own. I was rather grateful that last year there were only two chicks to keep track of. But with the possibility of four... well, I'll keep you informed! That is so cool. I'll have to search out the cam! How amazing to see that - even if it is the wrong side, it's still a wonderful view.